Wales got off to a winning start in their Euro 2020 qualifying campaign with Ryan Giggs at the wheel. A hard-fought 1-0 win over Slovakia on Sunday saw Wales pick up an important set of three points, with their first campaign under Giggs starting smoothly. Swansea City winger Daniel James scored the only goal just 5 minutes into the game, but another player with tons of potential drew the attention of Manchester United fans. That would be Bournemouth midfielder David Brooks, who played 60 minutes and was still arguably their best player. His performances this season have the midfeilder in contention for the Young Player of the Year award, which is remarkable considering Brooks was playing in the Championship last season. United fans reacted on Twitter to urge the club to sign the 21-year-old prospect, who has six goals for the Cherries this term. I’d take Brooks at United. Make it so Giggs. 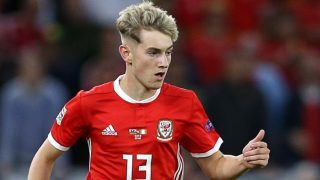 Back in February, the Manchester Evening News ran a report linking Brooks with a move to United, though there was a warning Tottenham Hotspur may look to compete for the exciting Welshman’s signature. If United are genuinely interested in signing Brooks this summer or in the future, Giggs will undoubtedly be fully behind the idea.